Let’s celebrate The Best of the City with our annual “Best Of” readers survey results! We’re writing about the Gold winners, and showcasing the Silver and Bronze winners in the over 120 categories shown below, but you,our readers, provided the results by voting in our annual BEST OF THE CITY ballot, which was in the June 2015 issue. 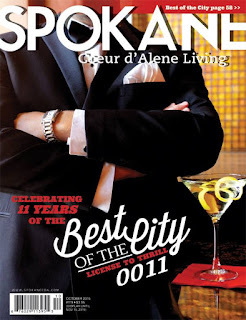 The results are in, and you officially have permission to scoff at anyone who dares to grumble there’s not enough to do in Spokane. This is one of the BEST cities there is, and we’ve got the goods to prove it. Read on to see why we live in the BEST city ever, and exactly what makes it so great! IDAHO: Post Falls Coffee Co.
Silver: Iron Goat Brewing Co.
HOW DO YOU STAY SO GORGEOUS?